Sculpted by the same master artist responsible for many of the Marvel ARTFX+ statues, Junnosuke Abe (RESTORE); It’s hero vs. hero as Kotobukiya’s hit Marvel ARTFX+ series returns to the big screen with the upcoming Marvel movie Captain America: Civil War. The Two mighty characters headline the new collection starting with the star-spangled hero CAPTAIN AMERICA and a brand new armor suit, the IRON MAN MARK 46! Captain America and Iron Man each stand just over 7 inches tall (in the ARTFX+ 1/10th scale). 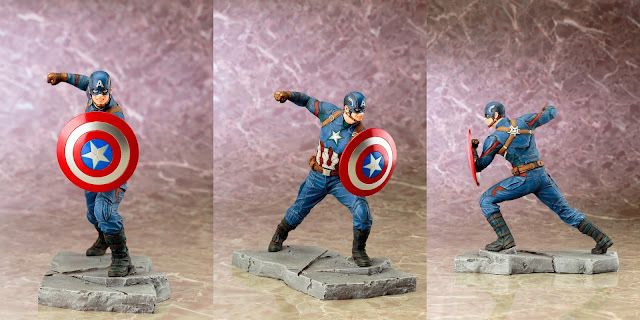 Both heroes charge dynamically across a cracked and broken concrete battleground, and while each Captain America: Civil War ARTFX+ Statue is an incredible display piece on its own, they’re even better together as their bases join to create an amazing battle scene! Fighting for what he believes is the true American way, Captain America (played by Chris Evans in the Marvel Cinematic Universe) heads into battle fearlessly against his fellow Avenger Iron Man. Captain America charges forward in his distinctive uniform, his shield leading the way and fist ready to strike for justice. On the other side of this Civil War; the latest creation of Tony Stark (played by Robert Downey Jr.) is the Iron Man Mark 46. It incorporates all of the brilliant inventor’s cutting edge innovations. 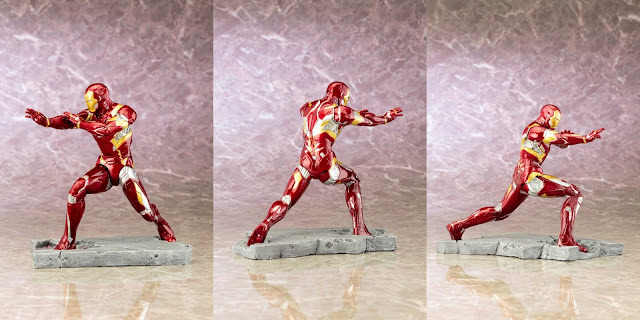 This brand new Iron Man suit is a perfect replica of the one you’ll see in the film, and it’s captured in a super cool battle pose as the Armored Avenger lunges forward and steadies his right arm for a repulsor ray blast! A direct descendent of previous suits like the Mark 43, the Mark 46 suit is a sleek war machine with interlocking armor plates, tons of technological details, and of course the awesome chest-mounted arc reactor and trademark faceplate. Of course, all of that is presented in gleaming red and gold with additional silver accents. The accuracy in these statues looks like they stepped right off the screen with an incredibly accurate sculpt. Capturing all of the intricate details; for Captain America his patriotic red, white, and blue costume including the reinforced armor, straps, buckles, boots, gloves, and of course the “A” mask with chin strap. And while the colors on his costume are muted his iconic shield is bright with metallic paint and will immediately catch your eye in your Marvel collection. Suggested retail price $69.99 for each of these statues and will be Available October 2016 just in time for those who like to do their Christmas shopping early.